In case you haven't heard the news Patrick and I were excited to announce our pregnancy last week! We're sharing the details here today with how we revealed the news to our immediate family. After Patrick and I had a positive pregnancy test and a few doctor visits we realized that Easter was a few weeks away and that would be the perfect opportunity to break the news. Easter also happened to fall right along the end of the first trimester and at the point we knew we'd feel comfortable revealing our secret. With this in mind I googled "spring pregnancy announcements" and was hit with a lot of Easter egg, bunny, baby chick, and jelly bean inspiration. I decided to have the jelly bean as the main theme with an egg and a baby chick making an appearance. Below is the assembled announcement. 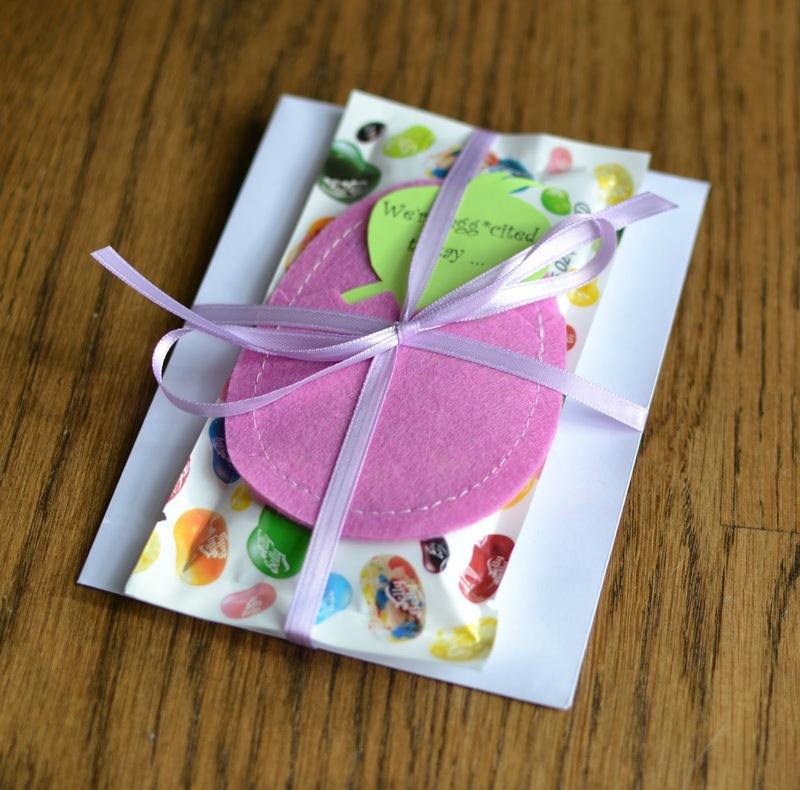 It contained the message, a pack of jelly beans, and a more official announcement in a card. If you were a family member that we were spending Easter with then your announcement was tucked into an Easter basket. Otherwise the announcement was bundled up and put into a mailer to be sent to unsuspecting family members. If you were a lucky family member that received a basket then you received strict instructions not to tell the secret for a whole week to ensure that everyone was able to open their package! I found the cutest felt Easter eggs at Target and knew they would be a perfect addition to the announcement! After I decided on the jelly bean theme I didn't have a firm vision for how the announcement would look. It came together over a month or so as I kept seeing things I liked. With the felt egg as my original purchase I began to add to the announcement with that in mind. The felt egg would contain a baby chicken with the phrase "We're egg*cited to say... A jelly bean is on the way!" When you first saw the egg and baby chicken only "We're egg*cited to say..." would be visible and you'd see the fun message when you pulled the chick out of the egg! Or maybe you'd just think you were getting some jelly beans. Finding personalized Jelly Belly jelly beans was a lot harder than I thought but eventually I snagged some and at that point knew the announcement would be a hit! In case someone thought they were just getting a bag of jelly beans we put an official "Baby Eibl Expected October 2016" on a card and wrote a personalized note. And finally the basket was put together with colored grass and a polka dot bow. If I thought finding Jelly Belly jelly beans was tough then I was really surprised when I couldn't find any gender neutral stickers! My original idea was to put some sort of generic baby stickers on the card like a bottle or stroller but everything was overwhelmingly blue, pink, or said "girl / boy". 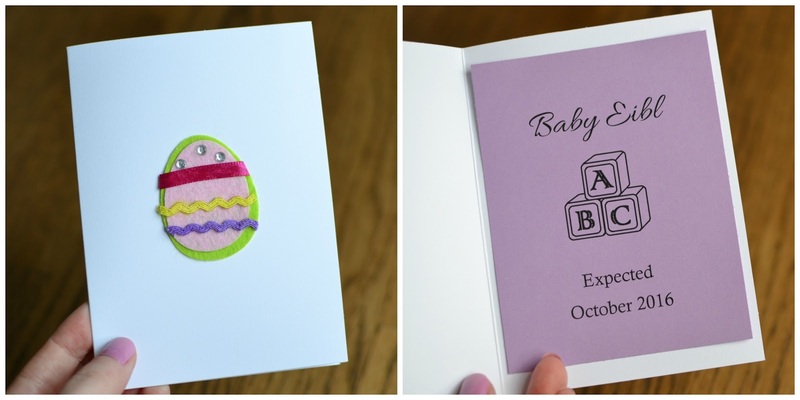 So on the front of the card I placed a felt egg sticker that I found in the Easter section which worked well with the other felt egg and then I placed a nursery blocks clip art piece on the announcement. And there you have it! 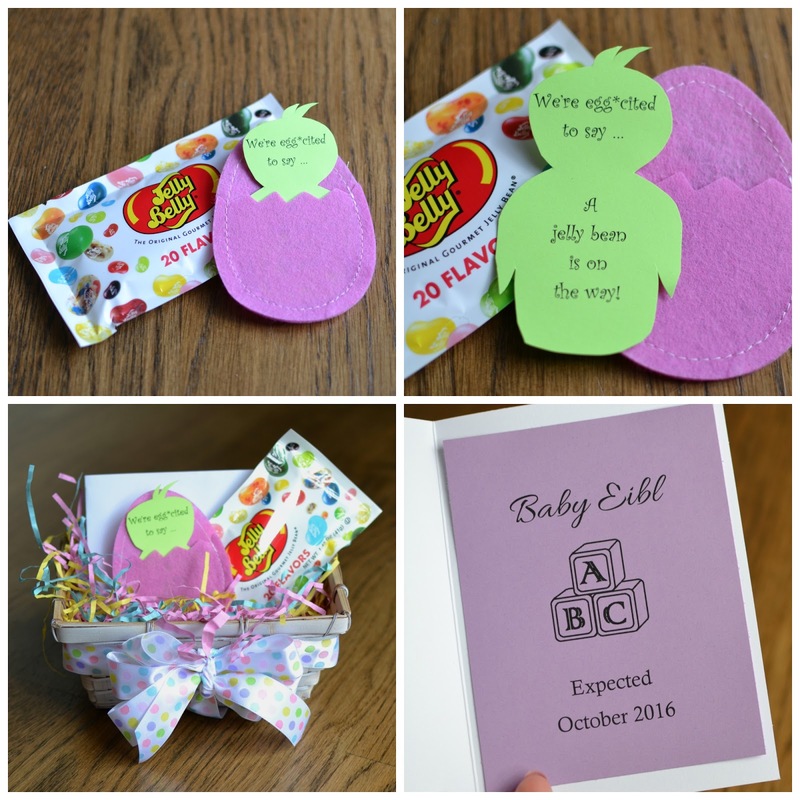 Our spring jelly bean pregnancy announcement. We are at fourteen weeks and looking forward to Baby Eibl's arrival. The most wonderful news and so special!!!!! Can't wait to be Grandparents! And the announcement basket and card were so pretty - I loved it!